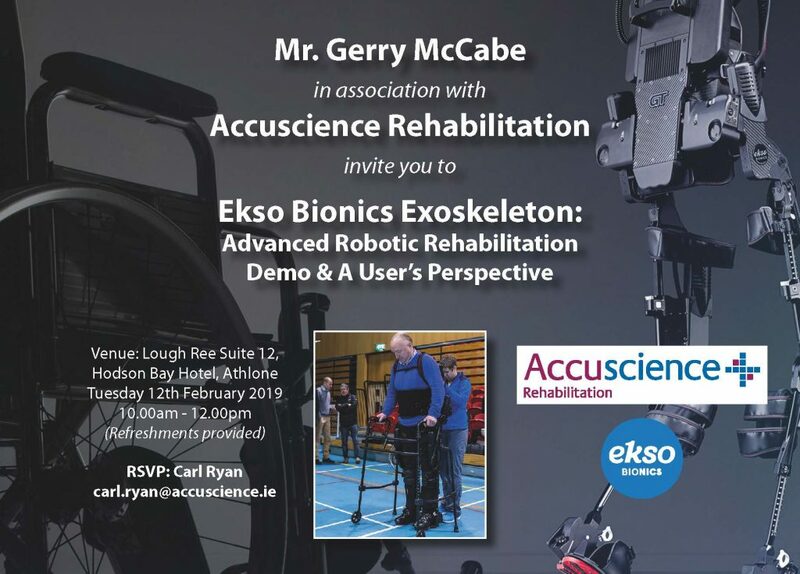 Accuscience Rehabilitation in association with Mr. Gerry McCabe are delighted to be hosting an event titles :Advanced Robotic Rehabilitation, Demo and A User’s Perspective. This event will take place on Tuesday 12th February between 10am-12pm. Gerry suffered a spinal cord injury after a fall in 2004 and his dream of walking again after his accident came true following fund raising activities by family and friends to purchase an Ekso Bionic exoskeleton suit. Gerry is now making his Ekso Bionic suit available to provide Ekso Walking Therapy for other people in his community. Please contact us if you would like further information on the range of rehabilitation equipment of on the Ekso Bionic Ekso GT suit.